With the new programme which launched recently, the older Guiding History badges will be retired in Summer 2019. So as well as retaining the information on the old 'Traditions' badges below, here is some information to help Guides working on the new "Guiding History" interest badge. Did you know that in some counties Guiding was suppressed for political reasons, and Guides had to hide their uniforms? If you found yourself in that situation, what six items would you hide to keep the spirit of Guiding alive? How would you hide them and why? Present your ideas creatively. Well, it really happened. In many countries across Europe, and in the Channel Islands of the UK, during World War 2, Guiding was outlawed. Instead, Government-approved and supporting youth movements were created, with compulsory membership. Had Guides been caught wearing uniforms, they would have been arrested, and jailed or sent to forced labour camps. So in Norway, some Guides buried their uniforms to keep them safe, and dug them up after peace was declared. Since the authorities had the right to search houses, and would arrested anyone they discovered was continuing to be a Scout or Guide, hiding places for uniforms had to be ingenious. In some countries, Guides formed themselves into sports clubs, or first-aid societies, in order to be able to continue meeting together and doing activies. If your Guide meetings were to be banned by the Government , what would you try to hide or protect? It could be things belonging to you, or things which belong to your unit which you would want to protect and save. Then think about the creative presentation bit - how could you portray your ideas in a creative way? During the First and Second World Wars, thousands of Guides helped their communities in lots of ways like giving first aid and making aid packages. Some slept in their uniforms, ready to hep throughout the night. During the Second World War, the Ministry of Food asked Guides to demonstrate 'blitz cooking' - cooking in ovens made of bricks from destroyed buildings - and to share recipes they invented using rations. Guides made meals for hundreds in bombed areas, with no kitchens. Make a recipe using blitz cooking (or as close as you can if you don't have bricks). Use ingredients only that were available on rations. Again, it really happened. It was first reported in Liverpool - the army said it would take them a couple of days to mobilise and set up a 'field kitchen' to feed bombed-out families. A Guide Leader stated that all she would need was a dozen bricks salvaged from the rubble, a couple of flat metal boot scrapers to set on the bricks to sit the 'pot' on, and a large metal dustbin which they could scrub out, and use to cook in. She stacked the bricks, they laid the boot scrapers across, and balanced the dustbin on it. Then her Guides set to and prepared the ingredients, and provided lunch for all the bombed-out residents. So think about what you know of backwoods cooking - what sort of foods would cook well on a fire? Then think about the rationing they had in WW2 - the foods which were rationed during WW2 were meat, sugar, butter, tea, margarine, cooking fat, cheese, jam, marmalade, treacle, syrup, eggs, milk, sweets. The weekly allowances were generally 100g of bacon or ham, 1s 6d worth of other meat, 50g butter, 50g cheese (vegetarians got extra for returning meat coupons), 100g margarine, 50g cooking fat, 1.2l milk, 225g sugar, 1 egg per week (sometimes per fortnight) 50g tea. Plus 350g sweets every 4 weeks, 1 pack of dried egg (equivalent to 2 eggs) every 4 weeks, 450g preserves (jam/marmalade/syrup/treacle) every 2 months. Plus 16 points per month to spend on items of choice (from what was obtainable). Bear in mind these are your allowances for a whole week - you wouldn't want to use your whole allowance for the week on one meal! They had free access to other raw or basic ingredients if they could afford them - so could obtain any vegetables they could afford, fruit in season, bread and milk. 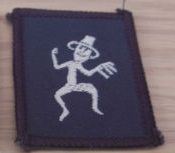 A semaphore chart can be found at http://www.anbg.gov.au/flags/semaphore.html - remember that what semaphore charts show is what the reader sees. it is a mirror image of what you will physically send, so you have to focus on what the right arm does and what the left arm does. When you are signaling you have to keep your arms straight and steady, so it is clear whether your arm is straight up, straight across, or halfway inbetween. To learn semaphore, it's best to start with the first batch of letters, which are signaled with one arm. Practice until you can signal any of the letters from memory, and make words from them. Then gradually add more letters. If practicing indoors, try to avoid shouting out instructions, as in real life you would be too far apart to should clues to each other. The best explanation I've seen is on the BOGUK website - http://guidinguk.freeservers.com/flag.html In most cases you would fold the flag, attach it to the flagpole ropes, and raise it to the top of the flagpole (still folded) before everyone gathered for the ceremony, leaving it with the two ropes wrapped around the cleat on the flagpole - the flag can be left in that position until wanted. During the actual ceremony the Colour Party of three Guides would be responsible for unfurling the flag. The Guide in the middle would be in charge. She would give the command 'Colour Party Forward March' and the three would then leave their place in the horseshoe and march towards the flagpole. A pace or two from the pole she would command 'Colour Party Halt' and would then walk forward to the flagpole by herself. Without undoing anything, she would then simply pull the rope to unfurl the flag, then wind the slack of the rope round the cleat. She would then step backwards to her place in the Colour Party, and give the command 'Colour Party Salute the Colour' and they would give Guide salutes. Then the Guider would give the command 'Company Salute the Colour' and all in the horseshoe would do likewise. Then the Colour Party Leader would say 'Colour Party About Turn', and they would all turn to the right on the spot, then 'Colour Party Forward March' until they reached their place in the horseshoe, then 'Colour Party Halt' and 'Colour Party About Turn' sees them back in their place in the horseshoe. If there are several flags to be unfurled (such as at an international camp) then they would be unfurled simultaneously, and the Guider might issue all the commands to the colour parties simultaneously, to avoid confusion, waiting until all the colour parties were ready before giving the next instruction. The WAGGGS website - https://www.wagggs.org - will give access to pictures of Guide uniforms from other countries. Sitting round the campfire, the front of you is warmed by the flames - but there can be draughts at your back, so in the early days of Scouting and Guiding, there developed a custom of taking a blanket to the campfire, to wear wrapped round your shoulders. Some people chose to make robes or ponchos to wear. Initially, the custom was to decorate the blanket with woodcraft symbols applied by applique or embroidery, according to your role at campfires - the person responsible for building and lighting the fire might have a flaming fire, the campfire leader might have music, etc. In more modern times, sew-on badges have come to dominate - some people choose to stick solely to Guiding badges which they have earned, or patches from Guide events they have been to and Guide campsites they have stayed at. Others add badges from all aspects of their life. You can choose to have a standard blanket, or can cut and bind a saucer-sized hole in the middle so you can wear it as a poncho (if your folks are willing to let you). World Thinking Day is held on 22 February each year. It's a day when we think about the founders of Guiding, Robert and Agnes Baden-Powell, and our long-term World Chief Guide, Olave Baden-Powell. It's also a day when we think about our Guiding sisters around the world - and at the very same time, they are thinking about us! Most of us will either mark Thinking Day with activities at our regular meeting place, or at a joint event with other units. But - this clause doesn't ask us to do the usual. It says unusual place. So where could you go that would be a bit different? Is there somewhere in your area that is up high or down low? Somewhere associated with local Guiding history? Something with an international link? Somewhere you could share Guiding history with people who might be interested? Where will your imagination take you? It's also worth considering that Thinking Day involves not just thinking about the Girl Guides/Girl Scouts in other countries (which is the part many units tend to focus on), but also thinking about the founders of Guiding - perhaps this year, for a change, you could share with your unit the true story of how Guiding started, and the various interlinked and sometimes contradictory roles of Robert, Agnes and Olave Baden-Powell? 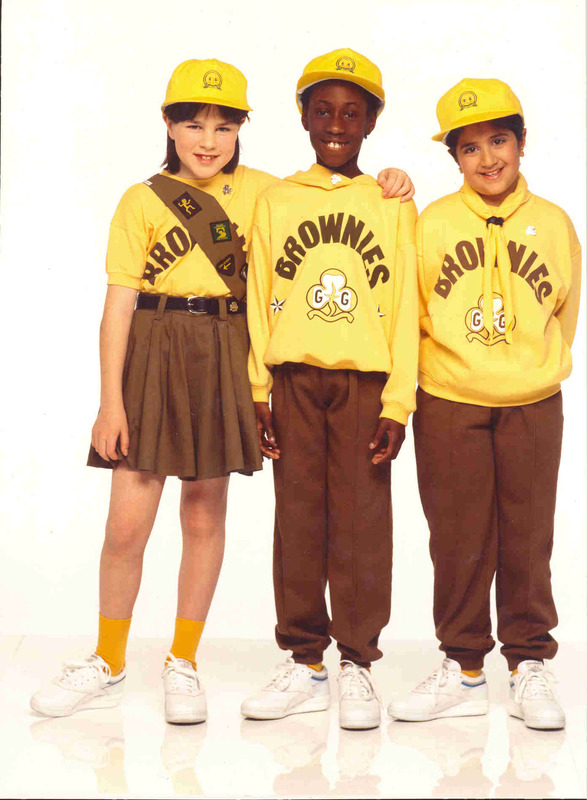 **how the Brownie uniform has changed. *Tie a reef knot and know when it can be used. Tie a bow in your shoelaces. Make a single plait with thin rope or cord. *Draw the Union flag and know how it is made up. *Show how Brownies used to tie their scarf. *Know the first verse of the national anthem. *Safely light a candle using a match. *Find out what Brownies used to carry in their pockets. *Find out about your Six emblem. With other Brownies, sing some of the Six songs that Brownies used to sing. *Draw a Brownie First Class badge. Know what "flying up" and "gaining your wings" involved. *Draw a picture of a Brownie magic carpet. *Find out what the Brownie fitness exercise and Brownie health rules were. Do them both for a week. 3. Make a scrapbook or poster showing what you think Brownies will be doing in ten years' time. In 1910, Agnes Baden-Powell was asked to start up an organisation, Girl Guides, based on the Boy Scouts her older brother Robert had started. 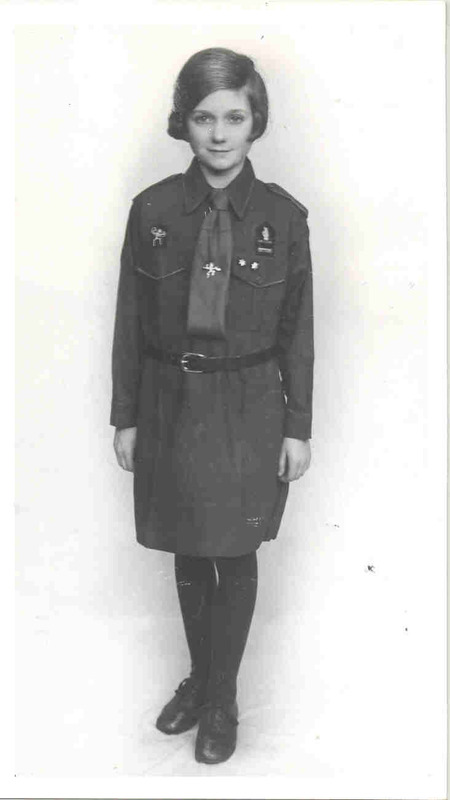 Girls had already been joining Scouts and doing Scout activities for a few years, as both Robert and Agnes had long known and approved, and the Girl Scouts were very skilled - and they felt it was now time to set things up properly with a separate organisation for the girls. These Girl Guides often went on umpteen-mile long all-day hikes into the countryside, carrying all their kit in home-made daysacks, exploring, spending some time spotting wildlife and cooking lunch on wood fires, and playing some games, then marching all the way back home again in the evening when it was getting dark. The problem was that their younger sisters wanted to go too, but they just didn't have the energy for the long hikes and the all-day activities. These younger girls were determined not to be left out of all the fun, so by 1914, they persuaded Agnes to create a group just for them. There had been all sorts of suggestions of what they should be called, and finally Rosebuds was chosen, with the idea that they would 'flower into Guides'. Well these younger girls loved the Rosebud games and activities, were happy with the uniform - but hated the name! Far too twee and soppy! So they campaigned again, and just a year later, in 1915, the name was changed to Brownies - Thus Brownies started in 1914 - 2 years before Cubs officially started! Until around the late 1930s, girls would not have worn trousers at any time - only ever skirts or frocks. By the 1940s it was becoming okay for girls to wear jodhpurs for horse riding, and dungarees or trousers for gardening or farm work where skirts and stockings could be an inconvenience, but normally not otherwise. Also, no-one would go outside without wearing a hat of some sort. 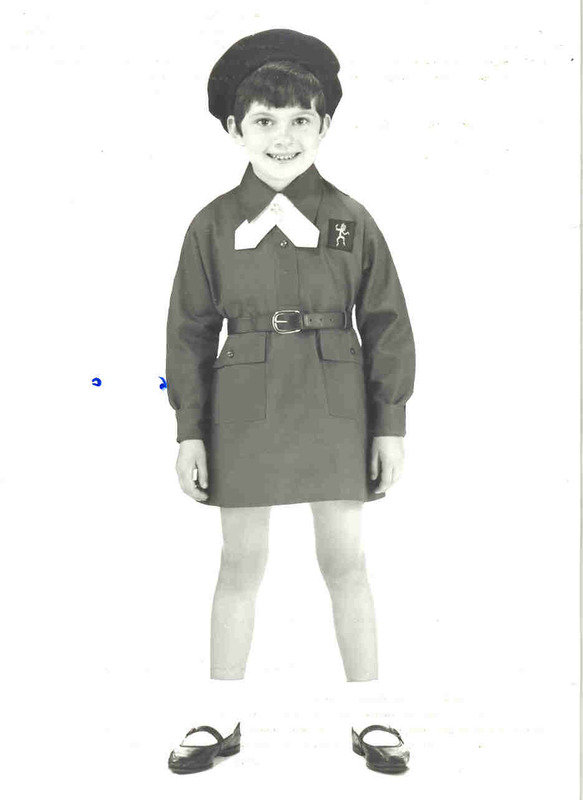 Hence, cotton dresses and uniform hats seemed quite normal to the girls who joined Brownies, not like nowadays, especially when worn with the same thick black wool stockings they would have worn to school anyway. The Rosebuds wore a navy jumper and skirt, with a large floppy beret-style navy hat and a loosely-tied tie in pale blue. In 1915 four uniform options were suggested - three featuring different forms of brown frock, and one in navy. 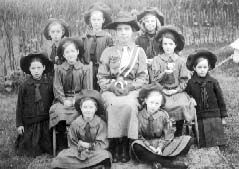 The picture above shows two girls at either side in Rosebud uniforms, and others in Brownie uniforms. 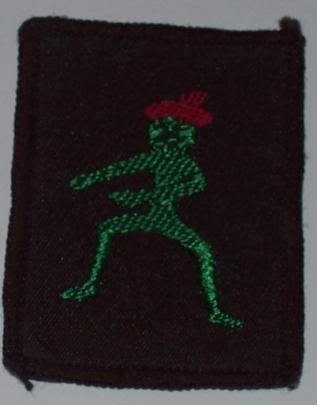 By the 1920s the uniform was standardised as a brown frock, with chest pockets, and most units wore a pull-on 'bucket hat', in either cotton or straw, although many variations in hat were still seen, including berets, knitted hats etc, and until 1931, the Six emblem was worn on the left above the pocket - it then moved to the right side. This uniform was worn with a brown tie (which was folded from a triangular bandage) as shown on the left, later in the 1930s the option of a gold coloured tie was introduced, so long as everyone in the pack wore the same colour - most packs then chose the more colourful gold as shown on the right. It also had to be worn with either black stockings or white knee socks (the options most schools asked for anyway), and the rules did actually specify wearing brown knickers! By the 1950s berets were the most common hat option seen, although variations and hand-knitted hats could still be seen - some packs did still hand out knitting patterns and wool to the parents of new recruits in the 1950s, for them to knit their own hats! In 1967 a new uniform dress was brought in, in a brighter, red-brow n shade, with pockets on the front of the skirt rather than the chest, a beret (soon replaced by a warmer and more practical knitted woolly hat with pom pom) and a yellow cross-over tie which didn't need to be folded! When not worn the woolly hat was usually tucked through the belt. And the Six emblem moved to the left again, as it had been pre-1931! The next change was in 1990, with the introduction of a mix-and-match range of yellow sweatshirts or brown wool jumper and 'forest brown' joggers or cullottes, with a sash for badges worn on the right shoulder with the notch against the neck, and a baseball cap - much more practical for colder weather, and closer to what the girls wore during the rest of the week. If you contact your local archivist, she may well be able to lend uniforms for the girls to see and perhaps even get to try on - much more fun to try wearing them than just learn the theory! Reef knots, bows and plaiting can easily be found on the web - three-stranded plaiting (left over middle, right over middle) is all that is required, though if any of the Brownies know how to plait more ends, then they could demonstrate and share their skills . . . The Union Flag (which is the correct name for our national flag, not the union jack!) was created from three other flags. On the top is the red + on white, the flag of St George, Patron Saint of England. In the middle of the 'sandwich' is the red x on white of St Patrick, Patron Saint of Ireland, and these are placed on top of the white x on a sky blue background, the flag of St Andrew, Patron Saint of Scotland. The first Union Flag was created following the joining of Scotland and England, through the union of both the Monarchy, and Parliament. So it featured the cross of St George on that of St Andrew. Ireland joined the United Kingdom in 1801, and a way had to be found to incorporate St Patrick's cross into the flag, hence the current design. St Patrick's cross is 'offset' - it's not exactly in the middle of the St Andrew cross - hence there's a right way up for the flag to be flown - with the broad white stripe next to the top of the flagpole. Flying it upside down is a distress signal or plea for help! Brownie Tie Tying - before you start to tie the tie, make sure it is well ironed, and if possible starched - it makes it far easier. Lay the triangular tie out flat on a table, underside up, with the long side towards you and the point facing away from you. Fold the point towards you once, so the point touches the hem of the long edge, then fold that short side towards you to the hem again, then a third time - you will then have a long narrow strip of fabric around 2 inches wide, with pointed ends (this is known as a trifold bandage in first aid), which you are about to turn into a standard necktie just like your school tie. To tie it, fold the tie in half along it's length about a third of the way down, and hold it with the short end behind, and hold it up with the long end in front. Fold the long end at a crisp right angle across the front of the short end, then fold it round the back, and right round to the front again, then tuck the long end you've been using up through the loop you have created at the front with that first turn you made. It should now look a bit like a necktie but with a square end at the bottom, and two longer ends sticking out of the top. Take a little time now to adjust the length of the tie, and neaten it up it's looks around the knot. Once it is neat, then tie the ends of the tie at the back of the neck, under the collar of the uniform dress, using a reef knot, and pin the (freshly polished front and back!) Promise Badge in the middle of the tie, halfway between the knot and the bottom. When worn, the bottom of the tie is meant to sit about three fingers above the belt . . . the pictures above will show how it should look when worn. (It seems that either modern torsos are longer, or necks may be larger, as it's sometimes difficult to get the tie to regulation length at the front and still be able to tie it at the neck without discomfort - in the past older Guides were advised to add strips of cotton tape to the ends of original ties in order to provide extra length for the tying so that is an option for taller Brownies . 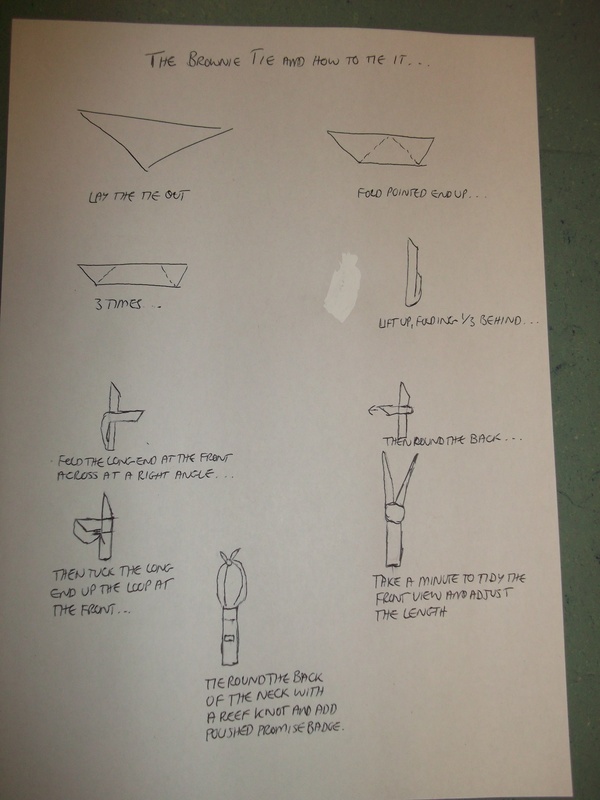 . .) I am no great shakes as an artist but have attached some diagrams below which will hopefully help add to the written instructions - but practice in private until you are confident, before trying to teach others! National Anthem - the first verse is: God save our gracious Queen, Long live our noble Queen, God save the Queen. Send her victorious, Happy and glorious, Long to reign over us, God save the Queen. The American song 'My Country Tis of Thee' uses the same tune, and versions can be found online if you wish to hear the tune played - or any musician or church organist would be able to play it for you. For teaching Brownies it is best to find or make a suitable recording for them to sing along to so they can match the words and tune together from the start. Perhaps some of the Brownies would be able to play it on recorder, piano or some other suitable instrument? Candle lighting instructions can easily be found in the web, but do be aware of safety - tie back long hair and dangling clothing, made sure the candle is fixed on a secure stable base, always strike the match away from you, hold the match straight across, never pointing down - because the flame always burns upwards - once you've blown the match out put it on a safe surface and not back in the box - and never light a match unless an adult says you can, you must get permission every single time - even if they've let you do it many times before! Brownie Pockets on the Brownie dresses were used to hold all sorts of useful stuff so the Brownie was ready and equipped for doing good turns at any time. The exact list varied from pack to pack, but typical items included a neatly hanked length of string, a notebook/paper and pencil, a coin to use in a phone box or to pay someone for using their home phone (mobile phones didn't exist! ), a plaster, a safety pin, a clean (fabric) hanky in a sealed envelope (for first aid), and a small plastic bag (e.g. a food bag). Brownies would also have their Test Card (pre-1968) or Pocket Book (1968 - 1990) - a little card or booklet containing the Brownie challenges she was working on, so a sort of mini Adventure book which was designed to be just the right size to fit in the uniform pocket, for easy reference. What would be the equivalent things be for the well-equipped modern Brownie to carry nowadays? The author Freda Collins, in her book "Pow Wow Stories" wrote stories for each Six explaining the alleged 'origin' of the rhymes - but in fact by quite a margin the rhymes came first! Most of the Sixes (and their rhymes) date from 1918, Ghillie Dhu was introduced in c1928, Fairy, Little People and Tylwyth Teg were dropped in 1968. At that time the Six Rhymes ceased to be an official part of the programme, but most units continued to use them. 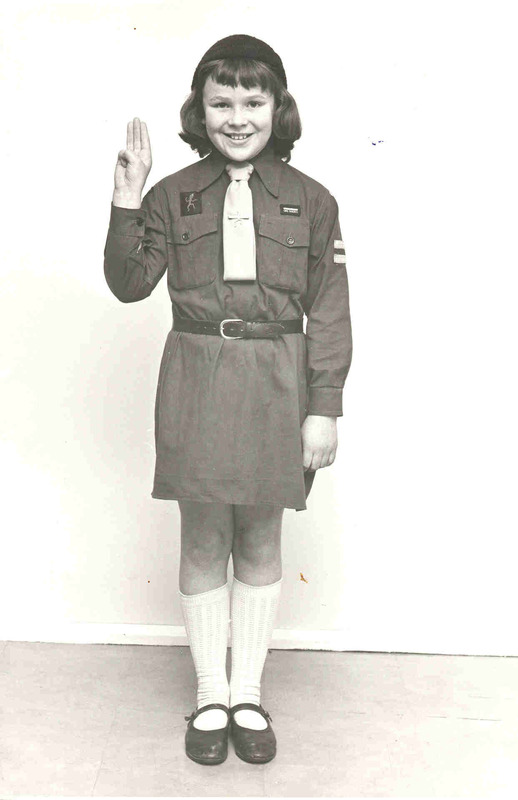 Brownie First Class and Wings - Before 1968, Brownies did not tackle the Adventure books we do now, instead they had set tests to pass - and every Brownie in the country had to learn the very same skills and pass the exact same tests. Before making their Promise, they had to pass the 'Tenderfoot' test, then they could start working on their 'Golden Bar' (shown below on the left), and would gradually pass all the clauses they needed to complete it. Once this was passed, they started to practice for the 'Golden Hand' (shown above left). 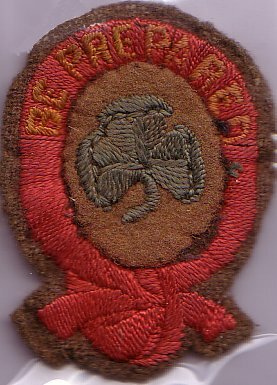 This was extra difficult because, although they could work up all the skills needed at pack meetings, and the craft items could be made beforehand, the actual testing had to be done by a qualified independent person, and it was all tested on one day - and they had to pass all the clauses on the same day in order to earn the badge, one failed would mean having to do a full resit. If they passed 'Golden Hand' before they moved on to Guides, they got a special badge, 'Brownie Wings', to wear on the sleeve of their Guide uniform (shown on the right) to show they had been a Golden Hand Brownie, and they had a special 'Flying Up' ceremony when they left Browies to move to Guides (often there would be a joint meeting just before their first Guide meeting attended by both units, with a special ceremony, invented by the units, to hand the Brownie over). Brownies who did not complete 'Golden Hand' still got to go to Guides, but they would have a slightly different ceremony as they would only 'Walk Up', and did not get a Brownie badge to wear on Guide uniform. 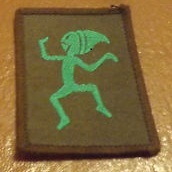 At that time, too, you couldn't start to work for any interest badges until after you had gained Golden Hand, which is why most Brownies of the era didn't gain very many interest badges - there often wasn't much time after finishing Golden Hand to gain them, before it was time to move on to Guides. Magic Carpet - many Brownie Packs had special totems such as an Owl, Toadstool, Pool or Pack Pennant at the centre of their Brownie Ring (then known as a Fairy Ring, after the natural rings of mushrooms/toadstools in the woods which some believed were caused by fairies dancing in a ring) - and these totems were traditionally placed on a special piece of cloth, which was their pack's Magic Carpet. Each was handmade by the unit, so sizes and designs varied, but it would usually be decorated with the badges of the Sixes in that Pack, and with any other pack awards, honours or special souvernirs which the pack had obtained. Occasionally the pack would gather round it to 'travel' abroad and 'visit' Brownies in another country before finding out about them and trying activities they might do. In an age when travel abroad was prohibitively expensive for all but the extremely rich or those fortunate enough to work abroad, and the chances of most Brownies ever getting to actually go abroad for real seemingly slim to nil, this make-believe was the next best thing. Brownies tended to pay their subs weekly, in copper coins, and this 'Brownie gold' (which some units encouraged the girls to polish up specially with metal polish so it really did shine like gold) would often be put on the carpet too, with each Six placing their money on their section of the 'carpet' as part of the opening ceremony of the weekly meetings. Nowadays many units continue to have a ring at the start and end of meetings, and to have special totems in the middle such as an owl, toadstool or flag, but magic carpets aren't so common. Fitness Exercise and Health Rules - the Brownie Health Rules were written in language that may seem a little old fashioned, but actually, they still make good sense. They were contained in a rhyme - "
Clean yourself both in and out, Twist and turn and run about." In other words - eat healthy food at mealtimes and not snacks/sweets, breathe through your nose rather than your mouth to reduce the number of germs you breathe in, make sure that you breathe fresh outdoor air (either from being outdoors or through opened windows) rather than stale indoor air, wash yourself, your clothes, and use the toilet regularly, and take plenty energetic exercise, preferably outdoors. It's basically the same advice that modern doctors would give for children - and adults! "Upper Body: From upright position bend to the front, arms stretched downwards, with back of the hands together in front of the knees. Breathe out. Raise the hands gradually over the head, drawing a deep breath through the nose as you do so - that is, drinking God's air into your lungs and blood. Lower the arms gradually to the sides, breathing out the word "Thanks" (to God) through the mouth. Lastly, bend forward again, breathing out the last bit of breath in you, and saying the number of times you have done it, in order to keep count. Repeat this exercise twelve times. Remember when carrying it out that the object of the exercise is to develop shoulders, chest, heart, and breathing aparatus inside you. For the Stomach: Standing upright, send out both arms, fingers extended, straight to the front, then slowly swing round to the right from the hips without moving your feet, and point the right arm as far round behind you as you can, keeping both arms level with the shoulders. Then, after a pause, swing slowly round as far as you can to the left. Repeat this a dozen times. This exercise is to move the inside organs, such as liver and intestines, and help their work, as well as to strengthen the outside muscles round the ribs and stomach. While carrying out this exercise the breathing should be carefully regulated. Breathe in through the nose (not through the mouth) while pointing to the right rear; breathe out through the mouth as you come round and point to the left rear, and at the same time count aloud the number of the swing, or, what is better, thinking of it as part of your morning prayer with God, say aloud: "Bless Tim", "Bless Father," and any of your family or friends in turn. When you have done this six times to the right, change the breathing to the other side; breathe in when pointing to the left rear and breathe out to the right." Whilst I wouldn't want to suggest, far less recommend, 'moving organs' within the body, the stretching seems harmless and may help with general flexibility . . .
1. Know how to fold a flag and hoist colours. Demonstrate your skills to your Patrol. 2. Demonstrate how to carry and present unit colours. Show how to roll, store and care for unit colours. Unit flags, or 'Colours', are normally carried using a flag holster (leather ones are by far the best, as they last for decades whereas on the fabric ones the buckle tends to slip most awkwardly after a while) - for Guides to carry flags, holsters must always be used, the flags are both far too heavy and too awkward not to! The holster should be adjusted for the individual Guide's height, so that the 'bucket' of the holster hangs down the outside of the right thigh at a comfortable mid-thigh height, making it easier to balance the flag's weight (you may need to adjust to make the bucket slightly lower than normal if the flag is being carried indoors by a tall Guide, in order to reduce difficulties with modern low ceilings and low doorways!). The flagpole should be held by the left hand at around nose height; this hand also holds the bottom corner of the flag against the pole to stop the flag from flapping about the bearer's face and blocking her view whilst she is on the move (traditionally army flag bearers would also have their left elbow out at right angles, but this can become uncomfortable over time and isn't really necessary - better for the elbow to be at a natural, comfortable angle). It is best, if at all possible, for the Guide to have a few minutes' private practice at just walking to and fro whilst carrying the flag, before trying other skills, as it can be a little awkward at first to get used to balancing the weight, and judging the extra height against obstructions such as lights, bus shelters and doorways (though the escorts should help with this!). Once she is comfortable with the basic carrying, she can try doorways - slipping the bucket of the holster round to the outside of her right leg with her right hand enables the Guide to lower the top of the flag down to a diagonal, supported by the left hand, so it can go through the doorway trefoil first - but it takes practice to work out how early to start lowering as you march towards the doorway, in order to get the flag low enough to pass through without pausing or reversing! (If you regularly have to parade in a particular building with low doorways, it can be worth setting up a permanent unobtrusive signal, such as a coloured label or ribbon, to indicate to the bearers when to start lowering flags for the doorway.) To present a flag, the Guide comes to the halt, then when it's her turn to present, kneels down on the right knee (the knee nearest the holster bucket), sliding the holster bucket down to her right side with her right hand as she does so, and when the person receiving is ready, eases the end of the flagpole out of the bucket with the right hand whilst continuing to hold the corner of the flag against the pole with the left hand, so the person receiving it can grasp the pole with both hands and lift it up and out of the holster. If the flag has loose joints, then the person receiving should be quietly reminded of this, so they can make sure they grasp the flagpole above and below the joint, to avoid embarassments! For longer parades, the flag should be carried 'at the slope' - the flag leant on the right shoulder with the end of the pole held diagonally in front - rather than upright - but if others are carrying the flag upright or the organisers request it, then you would follow suit. Flags should be stored in their cases when not in use, with the flag carefully rolled neatly around the poles to avoid wrinkles. Cased flags should be kept in a safe, dry place where the temperature is reasonably even, care should be taken to exclude moths and rodents (cedar wood or proprietary moth balls should be used to help with this if the flag is liable to be stored in it's case for any length of time). If flags are kept on display, then they should be checked regularly, and consideration given to regularly adjusting the position of the drapes in regard to fading. Flags can be hand-washed and dried flat provided they are not in too delicate a condition to stand this, then carefully ironed (on older Guide flags, ironing the apliqued trefoil on one side will automatically put massive wrinkles in the one on the other, it just can't be helped!). Older trefoils and pole joints are solid brass, so look good if treated with a little metal polish occasionally - wadding polish (such as duraglit) is usually easier to use than liquid polish, especially for doing the trefoils, as the liquid polish has an awkward habit of gathering in the many nooks and crannies of the trefoil! If holsters are leather, a little brown boot polish well worked or melted in helps to keep them supple, shining and smart, but needs to be polished up well so it doesn't stain clothes. Brown furniture polish or wax crayon of a suitable shade can be worked into any scratches in the wooden pole, then polished up to a shine to give it a smart even colour - but be aware that too much furniture polish on the flagpole can make it too slippery to grip properly! If a flag is becoming worn or fragile, consideration should be given to retiring the current flag, and perhaps obtaining a new one, especially if it would be regularly used outdoors in inclement weather - far better to make the difficult decision before the flag is damaged by weather, than after. Retired flags must be carefully looked after and treated appropriately, your County Archivist will be able to give suggestions of what can happen to retired flags, usually this would involve finding a suitable location for the flag to be 'laid up'. There are many flag customs and rules, (both written and not) used by different organisations - but bascially, so long as flags are always treated with respect and dignity, you are unlikely to cause any real offence. The most important and relevant custom is that the fabric of a flag should never normally touch the ground - so every effort should be made to prevent this, and the flag escorts (when used) who march either side of the flag bearer are tasked with helping ensure this does not happen. The only exception to flags not touching the ground would be if the flag was being ceremonially 'dipped' (usually only done in the physical presence of royalty, though sometimes nowadays done at some Remembrance ceremonies), but this is rare - normally such an occasion would be marked by allowing the fly of the flag to blow freely. Flags designed for hoisting on flagpoles should be folded in the hands or on a table, never on the floor/ground. In parades, the Union Flag should always go in front, with unit flags behind or to the left. Custom in parades is that the oldest organisation goes first, hence in youth parades it would be Scouts, then Guides, then Brownies, then Cubs - unless the organisers wish it to be otherwise, or by agreement where another arrangement suits the participants better. 3. Use and explain four whistle and hand signals. A succession of short, sharp blasts - Run Run Run, Rally, Close In, Come together, Fall In. Three short blasts followed by one long one from any Guider - Leaders come here! ie: Sixers, Patrol Leaders. If you associate the instruction with a phrase of the correct rhythm such as some of the ones above it is easier to learn them - like 'Leaders come here' or 'run run run' . . .
Hand signals were used, mainly by Guiders, in order to do 'silent drill' with their units. One still commonly used is the raised hand for silence - which should be obeyed the instant it is noticed. Others include the raised hand waved slowly from side to side which meant scatter or spread out; if waved quickly it meant close in or gather. A clenched hand raised rapidly up and down meant run away, and perhaps most importantly, a hand waved several times across the face meant cancel instruction or resume what you were doing! 4. Tie a reef knot and a packer's knot. Demonstrate their use on a parcel or bedding roll. 5. Traditionally, Guides march formally into a horseshoe. Find out how this is done and try it. Guides march into a horseshoe formation because it means they end up in a position where everyone can see and hear whoever is speaking (no-one stuck in the back row or behind someone tall) and it also demonstrates that each Guide is not just a member of her Patrol, but also of the unit as a whole, and each has an equal place. It's also useful to have a ceremony of some sort to signal that the meeting proper has started, and the time for chat and nonsense is over . . .
Patrols line up in rows, with PLs at the left of the rows, PS at right and the rest inbetween, facing the near end of hall and with the front Patrol about a metre short of the wall they are facing; the Guiders stand in a line to the left of the front row, but facing the other way down the length of the hall. The Guider gives the commands 'Company, Mark Time', then 'Company, Forward March'. The front Patrol Leader marches off round behind the Guiders, followed by her Patrol and then the other Patrols follow on in turn. She then goes down the left hand side of the hall, across the bottom near the far end, and back up the right side heading back towards the Guiders (by this time everyone should be on the move, even if you have a very large unit!). She then goes round and back down the middle of the hall until she is nearly at the bottom, where the last Guides are still marching round. Then first Patrol turn left and march up towards the Guiders, the next turn right and march up, and so on - once they arrive in place they march on the spot. Once the last Guides reach the bottom the leader calls 'Company, Halt', then 'Company, Inward Face' - and you have a horseshoe of Guides in their Patrols with the Guiders at the 'open end'. For teaching purposes you can get someone who knows (perhaps yourself) to lead off for the first time or two, as that way the Guides just have to follow you, and you can stop at the bottom and direct the Patrols to the left and right while you stand there, so they see what to do! When giving commands, you would give the first phrase (e.g. "Guides" then have a slight pause (so the group know who the command is being given to and so the relevant people are listening), then the rest of the phrase with the last word said firmly and sharply so that the instant it is said, the group should obey it. But there is no need to ape Regimental Seargeant Majors in either volume or elaborate pronunciation - clarity is what's important, not artistic impression! 6. Lay or follow a trail using woodcraft signs. Woodcraft signs can be created by scratching on bare earth with a stick or stone, tying long grass into knots which point in a particular direction, stacking stones on each other with one to the relevant side, sticking mini twigs through leaves, or laying sticks in right-angled arrow shapes. In urban areas chalk can be used to mark small symbols on the inside edge of kerbstones, or small pebbles can be laid in a pattern in the gutter. On the other hand, don't forget to tailor the difficulty of the signs to the experience of the trackers - Guides who are from urban areas won't notice any natural signs beyond the extremely obvious when in the country, especially if they are following a trail in groups, and carrying straight on whilst being distracted by chattering to pals is an option! You should also be aware of natural features which may confuse - does there just happen to be 3 sticks lying in what could be misinterpreted as a sort of arrow formation, or a stone sticking up with a few others which are sort of in a circle round it, which could be mistaken for part of the trail? Arrow left/right = route to take - two stones stacked with one at the side to indicate direction, knotted grass bent to the side, arrow made out of sticks or stones, thorn pushed through leaf etc. 7. Strike a match correctly and light a candle. First, gain permission from an adult in charge of you to light a match. Make sure long hair is tied back and dangling clothing such as hoody cords tucked in. Set the candle up securely so it can't topple/be knocked over once lit, and the wick is sticking up. Take one match out of the box, then close the box and turn it scraper side up. Holding the match level/sideways and securely near the end of it's stick, scrape it firmly but quickly away from you, along the rough surface on the matchbox. Once it lights (it may take more than one attempt) keep holding it level and touch the match-flame against the side of the candle wick. Once you think the wick is lit (or if the match is starting to burn close towards your fingers) take the match away from the candle then carefully shake or blow it out. Put the used match on a surface which won't burn (never straight back in the matchbox) until it cools. Once the candle is lit, make sure it is put in a safe place until it is blown out. Lit candles should never be left unattended. 8. Use Scout's pace to cover 1.6km or one mile. Remember a verbal message and deliver it at the end. Scout's Pace is a hybrid between walking and running - walking is a slow (albeit sure) way of delivering an urgent message, enabling you to cover a long distance at moderate pace. Running can be quicker - but not if you get a stitch, or the distance is too long to run and you're reduced to doing very slow walking before you even get halfway! Scout's Pace involves running twenty paces then walking twenty paces alternately - so you get the best of both worlds, the advantage of the speed of running, balanced with the extra endurance which the walking rest-breaks give you, meaning you can go further, faster. For remembering messages, it is worth picking out the key facts from amongst the text of the message, and going over these constantly in your head as you go, so they are still uppermost in your mind when you arrive . . . and when you do arrive, take a couple of seconds to gather your breath and thoughts so you can give the message in a clear and logical way, not blurt out what's uppermost then have to waste valuable time explaining, or waffling before you get to the key point . . .
9. Use semaphore to send and read a simple message. Remember that most charts show you what the receiver sees - they portray a sender facing towards you - which is a mirror image of what you will physically send - so always think of what the figure on the chart's right arm is doing, and what their left arm is doing. (if it's confusing you, it can help to mark out a semaphore chart on a sheet of transparent OHP film so it is reversible, and mark on which way round to use it for sending, and which way for receiving - so that you can have the diagram the right way round for whichever you are doing). Or make a cardboard cut-out figure with split-pin fasteners at the shoulders so it has movable arms, and can be turned to have it's face or back to you depending on whether you are sending or receiving . . . When signalling it's vital to have your arms absolutely straight and steady, and clearly positioned, so it's obvious to the reader whether your arm is definitely meant to be straight out, straight up, or halfway inbetween! For reading semaphore, unless you have memorised all the letters in semaphore (pre-1968 Brownies had to!) it is easier to quickly sketch two lines for the arm positions on paper as they are sent, and once you have them all noted down, use a chart to work out the letters they represent and write them in underneath your sketches, and then split them into words and work out what the message said. If you're doing signalling practice indoors, do try to resist the temptation to call out to each other across the room to explain what is being sent - in real life, the reason you would be signalling would be exactly because you would be up to a mile apart where shouting to each other wouldn't be an option - you wouldn't be able to yell across the valley to ask what that last letter was meant to be, or if it's the end of the sentence yet! If you are planning to memorise semaphore for the test, then it is best to learn a few letters at a time, and practice using them to send and receive simple words, then gradually add on more letters once the first ones are fully mastered and memorised. Traditionally, many would start with the 'first circle' using one arm, both because it offers a reasonable mix of vowels and consonants for making up practice words and sentences with, but also because it is easier to become used to which arm you are meant to use in both signalling and receiving if you start off only using the same one all the time. 10. Know the first two verses of your national anthem. It is easy to find recordings of the tune online to use when learning it, either in the form of the UK national anthem, or with the American words, My Country Tis Of Thee. If they wished, Guides from Wales, Scotland or Northern Ireland could choose to learn their countries' Commonwealth Games National Anthems in addition - Land of My Fathers, Flower of Scotland, Danny Boy. 11. Know ten significant facts about the history of guiding. Share this information with your Patrol in the form of a quiz, game, poster etc. Well, this website's full of facts - so basically, choose any ten which you personawlly consider to be significant ones! For quizzes I'd suggest multiple choice answers, so even people who don't know the answers stand a chance of guessing correctly - rather than have them sitting bored, or scared of saying something which could turn out to be silly - unless you happen to have been teaching the topics in recent weeks in the unit and folk can reasonably be expected to know the answers. There are all sorts of game options - you could tell them about an episode and challenge them to act it out, you could give them actual challenges such as Guides in past eras really faced - 30 evacuees are coming to this hall tonight, it's up to you to organise how to clean it, cover all the windows for the blackout and feed them on a 2-ring cooker with whatever food you can buy locally (no cars! ), you could have a game like snakes and ladders where a correct answer means you don't have to go down the ladder - lots of options. If you go for a poster, try to make it interesting - use coloured borders, pictures, coloured headings etc, to make it catch the eye, with small blocks of text giving straightforward details. The important thing to remember when teaching anything - is enthusiasm. If you genuinely enthuse about any subject, however dry it potentially is, and make it seem interesting or even exciting, you will automatically get others enthusiastic too, whereas if you sound bored, you can make the most exciting subject into a total bore in seconds . . .
12. Lay a table for a three-course meal. Use a centrepiece and fold the napkins in an interesting way. Firstly, lay a fresh, well-ironed fabric tablecloth so it hangs evenly over the edges of the table. There are set positions for the cutlery and glasses on a table, which is designed to suit right-handers since they are usually in the majority. For a standard three course meal the table mat (if used) is placed centrally in front of each chair (or space is left for the plates to go when the food is served). The dessert spoon is placed above the mat, with the handle to the right - if a dessert fork is used it is placed above the dessert spoon, with handle to the left. The fork is placed on the left and the knife on the right of the mat, it's blade towards the mat. The soup spoon is placed to the right of the knife, as when dining you always use the outer sets of cutlery first and work inwards. For a formal meal, the sets of cutlery for each course can be set out in order at each place. A water glass is placed on the right, above the knife and soup spoon. If used, a side plate is put to the left of the fork, and has a knife placed on it, blade pointed towards the mat (the side plate is used for spreading bread or rolls if served). If tea or coffee is to be served, a cup on a saucer would be placed above the water glass, with a teaspoon on the saucer to the right of the cup, as it won't be wanted until later. A folded napkin/serviette (whichever term you prefer) would either be placed on the mat or on the side plate. For fancy folding, fabric napkins have to be well-starched, and paper ones sharply-creased - a number of internet sites will give instructions for fancy folds, but whatever folding you do, fold them neatly and accurately to avoid corrections and crumples - a simple triangle crisply done will always look neater than a crumpled rag which sort of looks like a flower if viewed from a certain angle! A centerpiece could be a candlestick or candelabra, a vase of flowers or flower arrangement (real or artificial flowers), an ornament, decorative fruitbowl, or whatever sort of decoration would enhance the table (whilst not getting in the way during the meal, or preventing diners from seeing/being able to chat across the table - avoid a 'wall' of foliage!). 13. Set a map with a compass and walk on a bearing. 14. Whip the end of a rope to stop it fraying. You could use either simple whipping, or West Country whipping. 15. 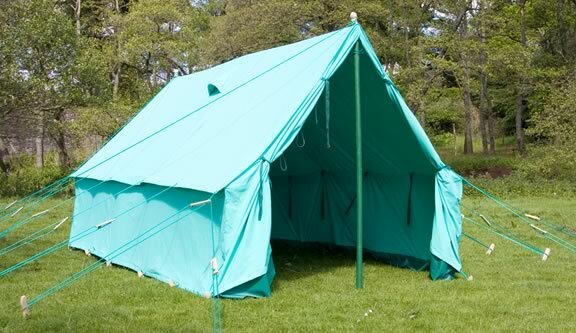 Do an activity that shows a camping skill; eg pitch and strike a tent, make a gadget, light a fire. 16. Explain and, where possible, demonstrate how to turf before lighting a fire. Assuming you have received permission from the landowner to light a fire on your proposed site, and to turf the field if necessary . . . If you can find a suitable clearing of bare earth to light your fire you may not need to turf, but if you are lighting a fire in a grassy field, you must remove the grass layer to expose bare earth before you can start to build a fire there, otherwise you will scorch the turf and leave an unGuide-like ugly scar on the grass for months. There are two basic ways of turfing - either cutting an x and folding back the 4 'triangles' created, or cutting an H and folding back the two rectangles. Whichever you use, you need to cut down several inches (the depth of a sheath knife or small garden spade) before you then cut sideways so that you are cutting underneath the roots of the grass, and don't damage them any more than can be helped. Make sure the area you expose is large enough to contain your fire, but not vastly bigger, as the less turf you disrupt, the better it will recover (for this reason the x shape can be good, as it can be extended in any direction at any stage before you actually light the fire). The cutting and peeling back can be done with a sheath-type knife when hiking, or with a sharp spade if one is accessible - an ordinary penknife's blade isn't long enough to get under the roots of the grass properly, and risks killing the grass unnecessarily. Once you have peeled back enough turf, cut the piece(s) and lay them to one side, grass to grass or earth to earth. If the turf is going to be lifted for more than a few minutes, do water it carefully so it doesn't dry out. When you are finished and you have ensured the fire is fully out and cold, remove the lump ashes and charred ends of wood for scattering somewhere unobtrusive, so you have a flat earth surface again, and carefully fold the turf back into place, treading it down gently and watering it in. The aim, as with all Guide outings, is to leave absolutely no trace of where you have been. At all times, remember the risks of causing fire in the countryside - always have water to hand to put out your fire in an emergency, make sure the earth is totally cold before you put turf back, make sure your fire is away from overhanging trees, fences etc - and most important of all, have the full approval of the landowner for your firelighting plans before you set foot on his/her land. 17. With your Patrol, plan and do a pioneering activity; eg make a rope ladder, haymaker bridge or swing. 18. Make and use a buddy burner. A buddy burner is a simple transportable heat source. It is a tin can, filled as tightly as possible with a strip of corrugated cardboard, with a wick placed in the middle, and the whole filled up with melted candle wax to make a sort of long-lasting candle. It can be used by itself as a stove (by inserting flat-headed nails around the edge to support a small pan), or can be used to power tin can cooking far longer than an ordinary candle does (and it is more stable). 19. Learn the words of the World Song and sing it with members of your Patrol. Is never furled throughout the world for hope shall never die! Until the earth in it's rebirth shall sing our song, shall sing our song." 20. At a campfire, prepare and cook dampers. Damper is a form of unleavened bread, and although it can be made as a flat bread, Guides nowadays tend to more commonly make damper twists. The actual damper mixture has 3 ingredients - plain flour, a pinch of salt, and water. Mix to form a stretchy dough. Take some sticks, ideally at least 1.5cm diameter and smooth. Remove the bark and soak in water for a few minutes, so they are damp (fireproofing, and the steam helps the cooking), and fairly clean. Make a long thin sausage of the mixture and spiral it round your stick. Prepare an area of red glowing embers in your fire, and hold/suspend the stick with the damper twist over the fire, turning occasionally. When it is ready it will have a hollow sound when tapped with a fingernail. It can then be slipped off the stick. It is customary to fill the centre of the twist with jam (although marmalade, chocolate spread etc have been known), as the damper dough itself is rather tasteless. 21. Find out what Guides did for a 'first class' award. You must be a Second Class Guide and have a good influence in your company. Read Scouting for Boys and state briefly the origin of the Guide Movement, and it's development. Estimate three of the following: height, weight, distance, number, time. The percentage of error may not exceed 25%. Be able to use a compass and find the 16 points by the sun and the stars. Understand the meaning of thrift and show that she has endeavoured to prevent waste in six practical ways - three with regard to her own property and three with regard to that of other people. Train a recruit to pass her Tenderfoot test. Hold Cook, Needlewoman, and Child Nurse Badges. Walk two miles in 30 minutes (Scout's pace if necessary) and arrive in good condition. Be able to teach a Tenderfoot the Health Rules. Must be able to swim fifty yards, and throw a life-line (tackling the alternate clause entitles you to the Green First Class only). Have an intimate knowledge of the neighbourhood within a radius of half a mile from her home or Guide Headquarters (for country Guides, one mile), and be able to direct a stranger to the nearest doctor, fire, ambulance, telephone, police or railway station, or post or telegraph office, pillar-box, garage, and nearest place for petrol, etc, from any point within that district. Be able to read a map, and know to which places the main roads lead. Draw at the test a rough sketch map which would enable a stranger to find his way from any given point to another. Take two other Guides (not First Class) for a half-day's hike, when possible following a map. The tester, who may accompany or join them at any point, should judge them on their general turn-out, manners, care of other people's property, clearing-up, enjoyment, etc, type of food and it's method of cooking. Know how to deal with the following: shock, haemorhage (various methods), asphyxiation (artificial respiration), fire accident and ice accident, unconsciousness from accidents, fits and fainting. Understand the preparation of bed for patient; the changing of sheets and the prevention of bed sores. Be able to use a clinical thermometer and apply fomentations. 22. Make a lanyard to wear at camp. 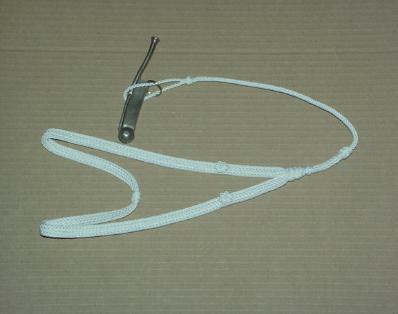 A lanyard is a neck cord which is used to hang a useful item so it is to hand - for sailors the item would be their Bosun's whistle or sheath knife, for Guides it can be a whistle or even a pen. It should be long enough to be able to hold the knife or whistle at arms-length when wearing it. 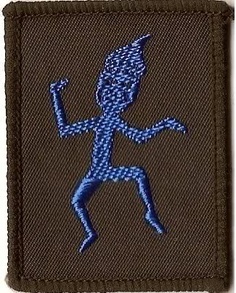 Guides should make theirs in white (which was traditionally the colour of a Patrol Leader's lanyard), as other colours were used for Camp Licence holders and Brownie Holiday Licence holders (green and brown respectively). A camp lanyard is made from fine cord called Plater's Line, and decorated in fancy knots, just as sailors used to do. Commonly used knots include Turks' Heads, Rolling Boatswain, Flat Sennit, etc. The best option is to get a knot book or look online and practice making the knots in ordinary string until you are familiar with them, before you start on your lanyard proper. If you can get hold of the old Guide book 'Help Yourself to Knotting and Lanyard Making' it gives knot instructions, measurements, and suggested designs. 23. Learn two graces and teach them to your Patrol. And help us now to spread our love to people far and near. For the fun we share, all day through, we thank you, we thank you. 24. Demonstrate the international symbol of recognition when meeting another Guide. Smile - a universal sign of friendship. Shake hands with left hand. 25. Know what makes up the Union Flag and draw it correctly. The Union Flag consists of three other flags. There is the flag of St George of England - a red + on a white background, the flag of St Patrick of Ireland - a red X on a white background, and the flag of St Andrew of Scotland - a white X on a sky blue background. There is a particular way up which the flag should always be flown - with the Union Flag, as with all national flags, flying the flag upside down is a way of indicating that you are in distress and need rescuing! With the Union Flag, the diagonal crosses are offset, so the broad white stripe should be nearest the top of the flagpole. 26. Research a guiding tradition in another section. Well, this website is full of them. Brownie traditions include the Brownie Ring, Owl, Toadstool, pow wow ring, Rainbow traditions include Rainbow Rabbit, Olivia, Pot of Gold, Senior Section traditions include Promise ceremonies in unusual places, community service . . .
a) Be able to talk about Guiding from its beginning at the Crystal Palace Rally in 1909, including the development of World Guiding. b) Know how Guiding developed in your own country. c) Understand the basic aims and principles of Guiding. Given the level that Commonwealth Award is at, the last thing I want to do is supply chunks of text which people can just copy and paste verbatim to put in front of an assessor, giving the impression that it was all their own research work, when it was actually my hard work and hours of research! So, although much of the information you would need to use to answer the clause effectively is available in this site, I'd rather people had to actually read through the site and pick out for themselves the bits they consider relevant, and to have found and read some of the other history books and history sources listed too, not just rely on my having done it and interpreted it all for them ;-) Maybe the things they consider relevant are different to mine! You should certainly try to get hold of and read a copy of "Scouting for Boys", of whichever edition - and a copy of "How Girls Can Help to Build Up the Empire" if you possibly can - a facsimile was issued a few years ago, so your County Archivist should be able to help you with accessing a copy to borrow. It will be a real help in understanding what it was that attracted youths to joining these new clubs when there were so many boys' and girls' clubs out there, many with similar activities. You should also read at least 2 other general Guiding history books, if possible from different eras (ideally pre- and post-1977) - and should compare and contrast the versions of Guiding history in them. Are there areas where they disagree about a particular event or topic, or where they interpret the same event differently? I also think that, as part of your research, you should be able to talk about more than just the national picture - not just mention how Guiding started in the UK, or in your Country as a whole, as given in whichever of those books you studied - but should also be able to say something of how it got started in your particular district, town or village - can you find out when your current unit started, perhaps also who the first leaders were? What about your Guide Company, Brownie Pack or Rainbow Unit? Were there any units in your area before or during World War 1 or 2? Were local units involved in any war service in WW1 or WW2 - if so what did they do, did they have Guiders during the war or were they run by PLs? Or is your unit a younger one, with the possibility that you could get to meet one of the founding members and find out from her what it was like when it first started - or maybe that's a story you can tell first-hand, and record now, for future generations to discover? Your County Secretary and County Archivist will be able to give you some information to start the hunt for your unit's roots . . . and it will show that you have done some research work of your own. Some of these Countries were in what was then known as the British Empire (now the Commonwealth), so were closely connected to Britain in that way, and in some cases ruled directly from Britain, hence the early introduction of Scouting/Guiding by British people who brought the idea over with them, having encountered it while back in Britain on breaks. Others got to hear of Guiding through obtaining copies of the books, and translating them for themselves, or through nationals who had been visiting or staying in Britain, then going home and telling of the new scheme they had seen . . . Many countries have published books about their Guiding history, sometimes Regions or Counties have produced books or booklets, or put information on their County website too, and your County Archivist will be keen to help you with your researches - your Guider can give you their contact details. Some newspapers have searchable databases which would help you to trace period newspaper articles about early Guiding in your local area (I've read some original newspaper accounts of the Crystal Palace rally in national and regional newspapers this way, and several fascinating accounts of various Scout and Guide rallies in my home city pre-1914) - both national and local papers can help. Most Counties would publish annual reports, and many produced regular newsletters too - these may well contain items about local units in your area, with information of what the units were doing at meetings and residentials. "The aim of guiding is to help girls and young women develop emotionally, mentally, physically and spiritually, so that they can make a positive contribution to their community and the wider world." membership which is self-governing, with freedom to formulate its policy and put it into practice. But the clause asks you not merely to have read them, but to understand them - so it sounds to me as though you have to interpret what they mean, and how they are applied in your country - what are the ideals behind your country's Promise and Law, how open is the membership in your culture, to what extent is it self-governing, and to what extent governed 'from above'? How does Guiding help young women develop emotionally, mentally, physically and spiritually in your area? Big questions, which only you can answer from your experience and related to the Guiding you have experienced in your locality. For these, my opinion, and practice in my area, doesn't matter a jot!